This is one of the easy to make recipe. You can prepare matar ki khichadi if you don’t have any plan about your lunch or dinner. 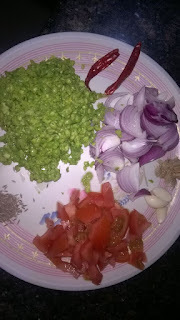 This matar ki khichadi is the best of winter session because fresh green peas is available in market. This recipe is my mom’s recipe and its my favorite recipe. You can enjoy your khichadi any type of raita, salad and papad. Preparation Time-5 min. Cooking Time-15 min. Grind matar and crushed ginger garlic. Soaked rice atleast 15 min. Now heat cooker and add desi ghee,hing, jeera, ginger- garlic, and sauté 1 min . Now add chopped onion and sauté. Add garam masala, turmeric powder, salt and matar sauté for 2 min. Now add soaked rice and sauté 1 min.